At Morton, WA Loggers Jub. 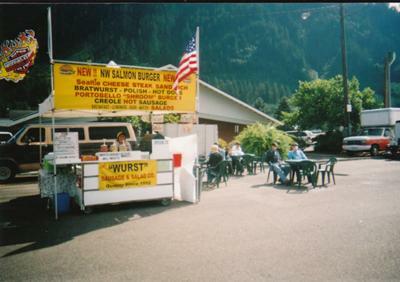 Quality since 1992, serving The original Seattle Cheese Steak, Northwest wild Salmon Burger, Vegetarian Portobello Burger, Garlic Buffalo Balls Sandwich, various Sausages & "Specials". For booking information or questions contact via email at thewurstsausageco@yahoo.com.